Stormy Weather: Are We Well Prepared For The Next Disaster? 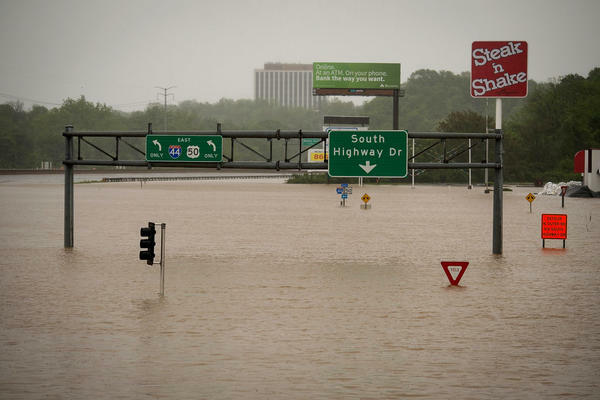 Highway exit signs are submerged in floodwater on Highway 141 in Valley Park, Missouri. Flooding hit towns along the Meramec River this month after days of rainfall. Storms are dropping record rainfall in the Midwest. Tornadoes are also appearing in parts of the country where they don’t commonly touch down. There is major damage in western Wisconsin after a massive severe storm system traveled from the South Plains of Texas to the Great Lakes. At the same time, several states are not getting the weather disaster aid they say they need, and the Trump administration is proposing cuts to the Federal Emergency Management Agency. With another summer of record heat, flash floods and extreme weather possibly on the way, how well prepared are we?